Momma of 3 amazing children and also 180 6th graders 9 months of the year who I teach that climb into my heart like my own children. 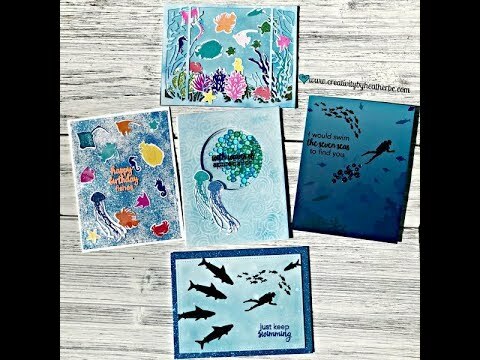 To let the stress of life and teaching go I love to create cards for family, friends and those who need a little pick me up. Love CAN Change the World! It is Wednesday!! Today the Brutus Monroe Inspiration Team is showing you fun projects using Glitter Glaze. 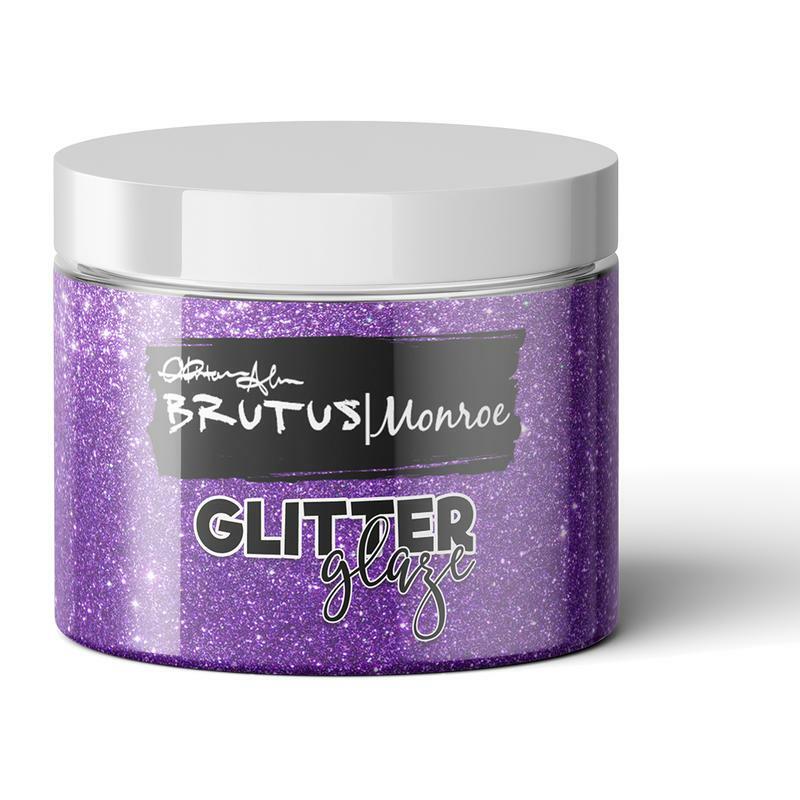 Brutus|Monroe Glitter Glaze is an incredible glitter medium that will make your project sparkle and shine. 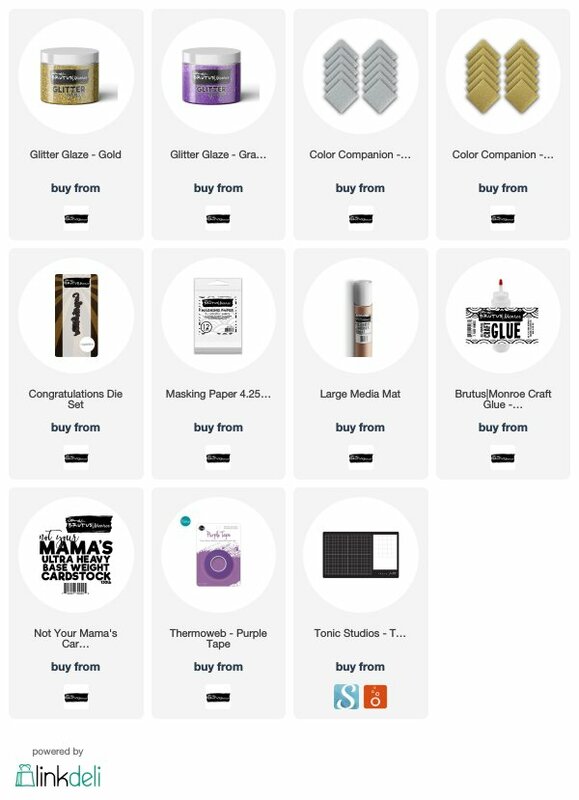 Our glitter glaze is based on the silk screen method of creating our popular Glitterstock. Using the glitter glaze is a breeze with stencils and screens with a palette knife. 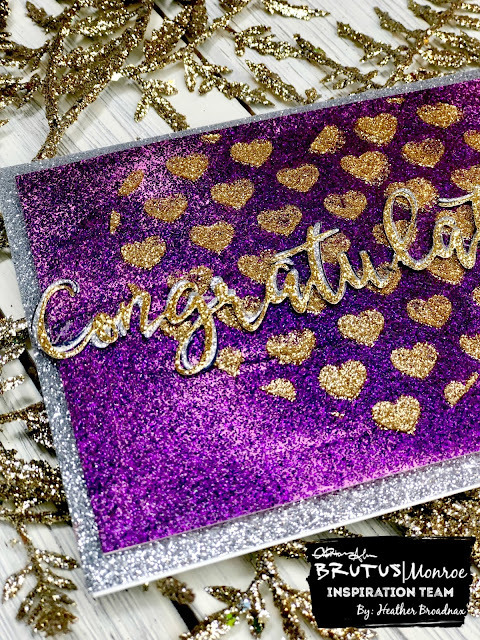 For today's card I used two different colors, Grape and Gold and layered them using a stencil. To start, I taped a piece of Not Your Mama's Cardstock to a media mat using purple tape. This cardstock is very thick and holds glitter glaze well. Next, using a pallet knife a layer of grape glitter glaze was added. 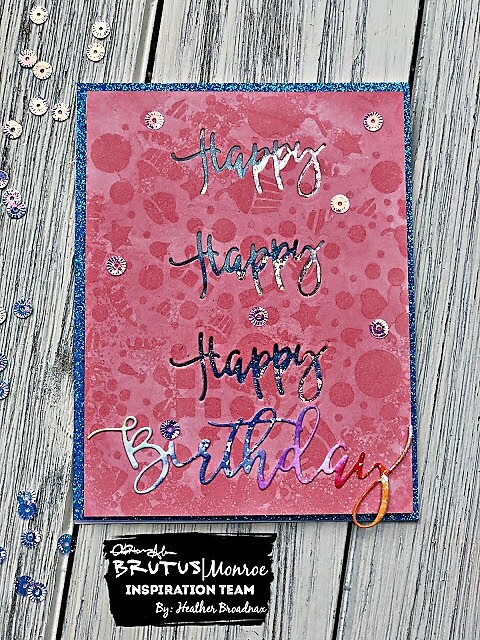 When adding glitter glaze you can control the thickness by adding a thin or thick layer on your paper. 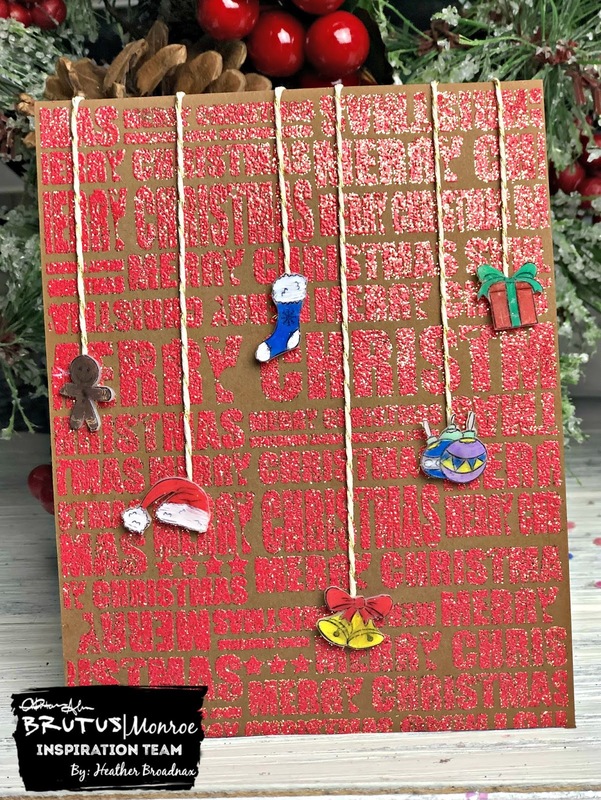 You can also ink the paper first with a color similar to the glitter glaze that you are using and put a thin layer that will show the color from the paper in some area's. The skies the limit with how you want to use your glitter glaze. While the grape was drying I used masking paper and a heart die to cut a large heart in the middle of the masking paper. Once the grape glaze had dried the mask was over the panel the heart stencil was taped down to the the mask. Using the gold glitter glaze, and a pallet knife I added a thin layer over the heart stencil. Before the gold dried the mask and stencil were immediately removed. The sentiment was added using layered gold and silver glitterstock cut from the "Congratulations" die and adhered with craft glue. 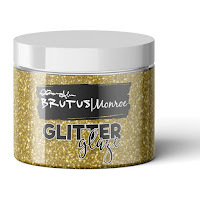 There are so many fun and creative ways to use Brutus Monroe Glitter Glaze. Check out what the rest of the fabulous team created below. Note: I do use affiliated links. What this means to you is, at NO additional cost to you I receive a commission when you purchase a product through one of the product links. This allows me to continue to purchase new products and create additional inspiration. 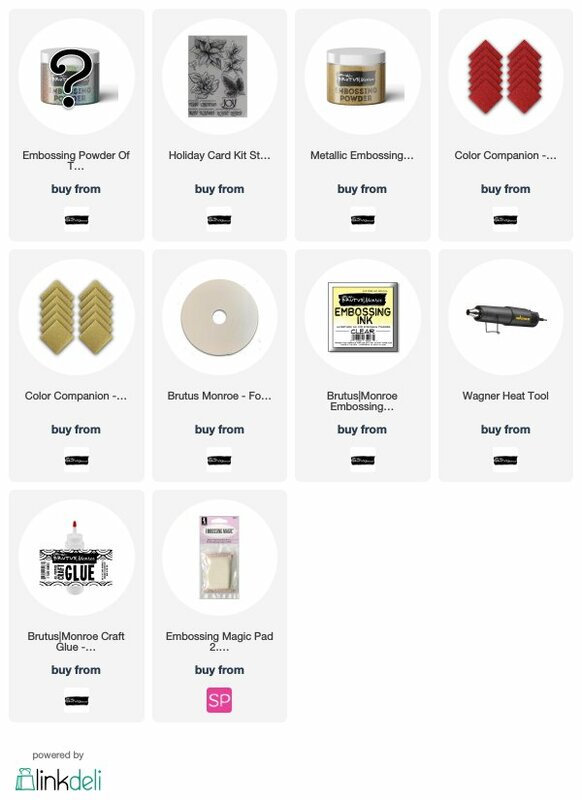 I list links for several companies so you are able to locate the best prices for the product. Hello Crafty Friends! 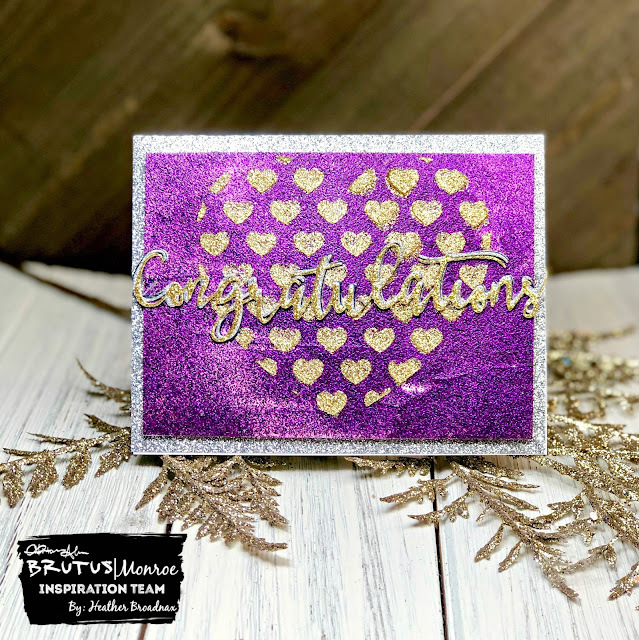 It's Heather B. here with a fun seasonal birthday card using Heat-Resistant Vellum and the Brutus Monroe & Unity Miracle of Nature background stamp. 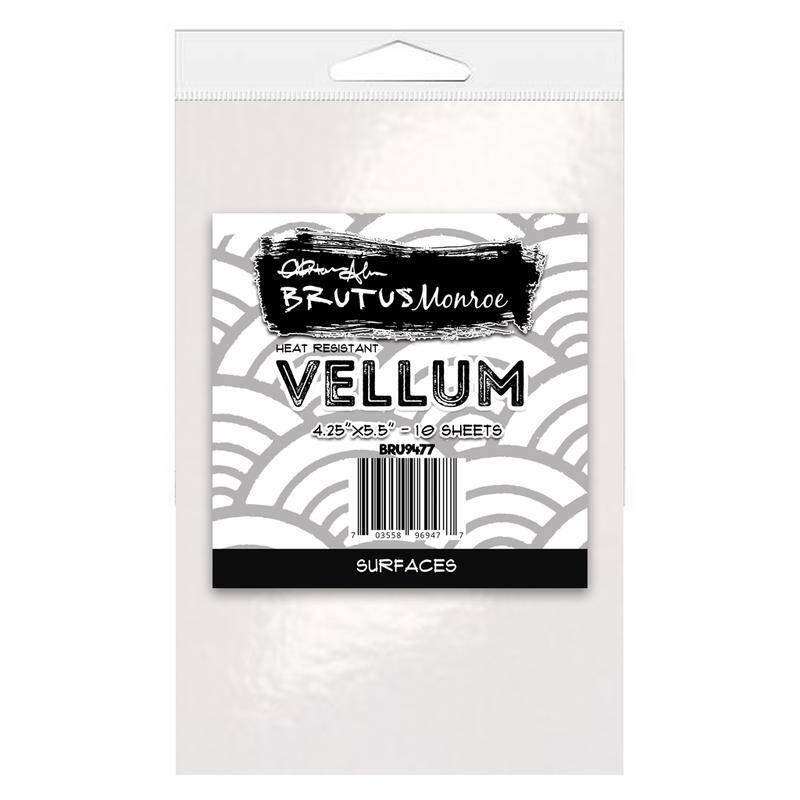 The Brutus Monroe Vellum comes in a pack of 10 sheets sized to 4.25 X 5.5. It is heat resistant which makes it perfect for heat embossing. 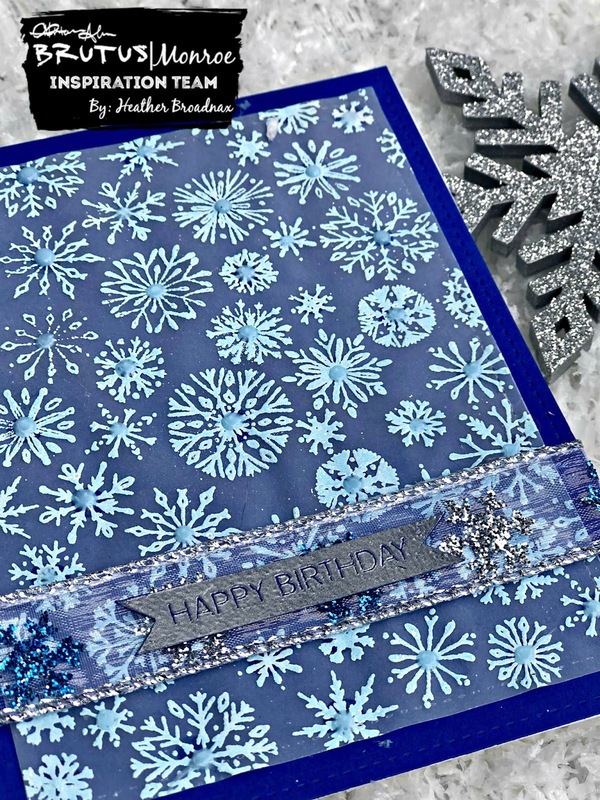 If you have someone in your life with a winter birthday this card is perfect. To begin I placed the vellum in my Misti using a small amount of removable adhesive on the back to hold it in place. The Miracle of Nature background stamp was inked up with clear embossing ink and stamped onto the vellum. I repeated the process twice to make sure there was solid stamping due to the size of the stamp. Next, the lightest blue color from the Hanukkah embossing powder collection was added to the vellum. To heat set the embossing powder I used tweezers to hold the vellum while heat was applied using a Wagner Heat Gun. When you heat emboss on non-heat resistant vellum you have to be very careful when applying heat or the vellum will turn a brown color from burning. 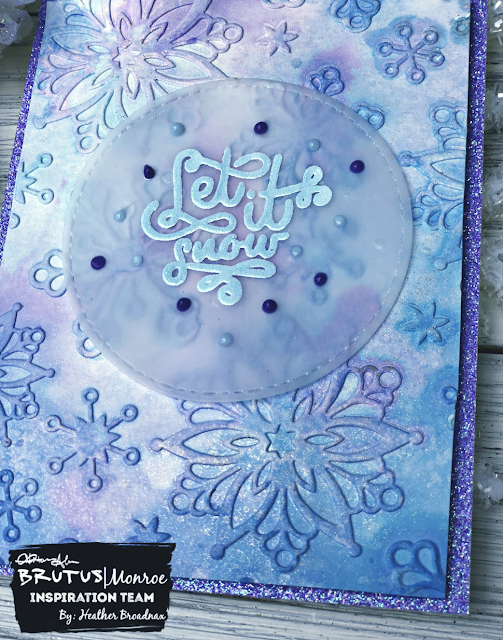 The heat-resistant vellum allows you to apply more heat at a time to melt the embossing powder evenly. A piece of ribbon I had in my stash with silver and blue snowflakes was wrapped around the bottom of the vellum panel. 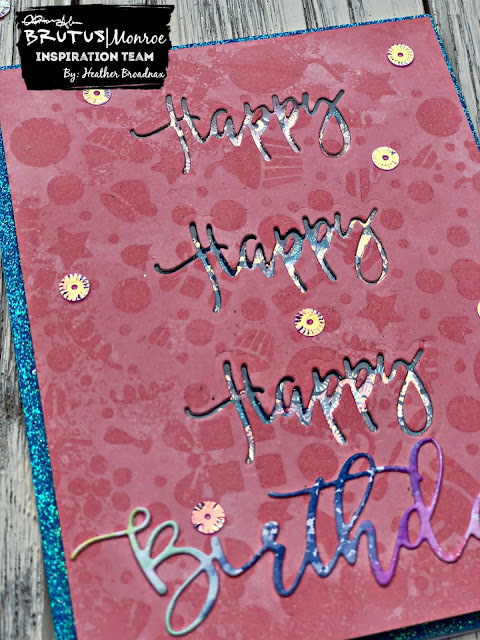 The ribbon is where I placed the sentiment banner created using Sterling embossing powder and the "Happy Birthday" sentiment from Botanical Banners. The final step was to add the vellum to a piece of blue cardstock. To adhere the panel I added a small drop of glue to the center of each snowflake and set something heavy on it until it dried. I hope this has inspired you to try out heat resistant vellum for your projects. We love to see the amazing projects you create. 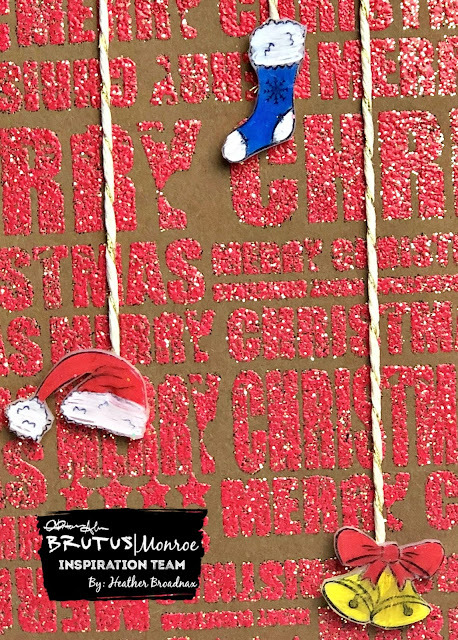 Don't forget to tag us on social media using #createyourownending #brutusmonroe and also on our fan Facebook page. 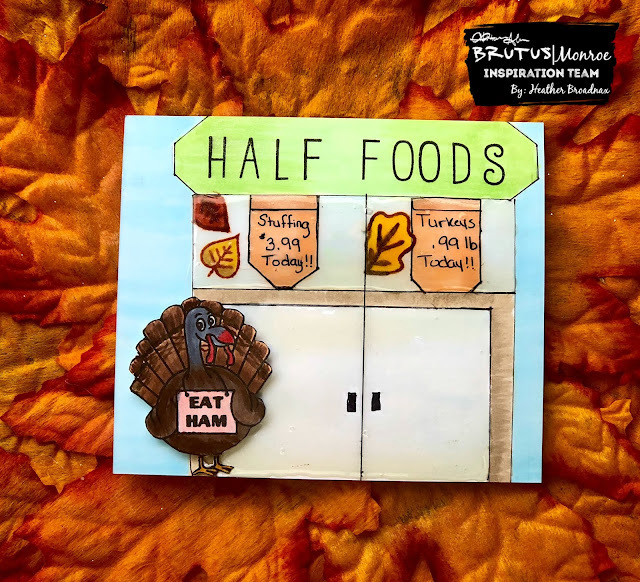 It is Wednesday and that means another fun Wednesday Blog Hop from the Brutus Monroe Inspiration Team. 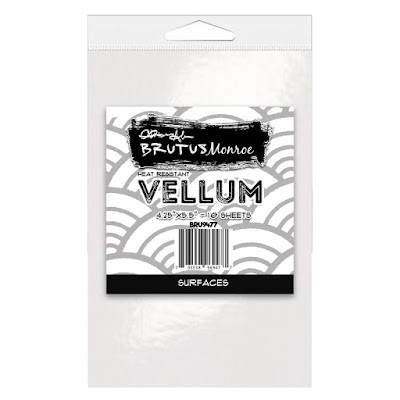 Today we are all creating with Brutus Monroe Shrink Film. The Brutus|Monroe premium shrink film can be used to create all kinds of super cool embellishments. The unique matte finish will allow for the Brutus Monroe surface inks to adhere to the surface of the material. Once dry you can either cut out the image or use a coordinating die for the perfect trim. Then take your favorite heat tool and the image will shrink down to 1/10th the size! 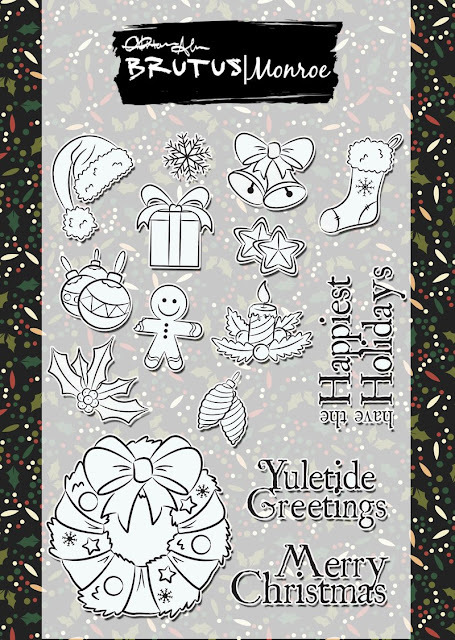 I decided I wanted to create tiny ornaments using the Yuletide Greetings stamp set. There are several small stamps in this set that were perfect for making images that could look like ornaments. 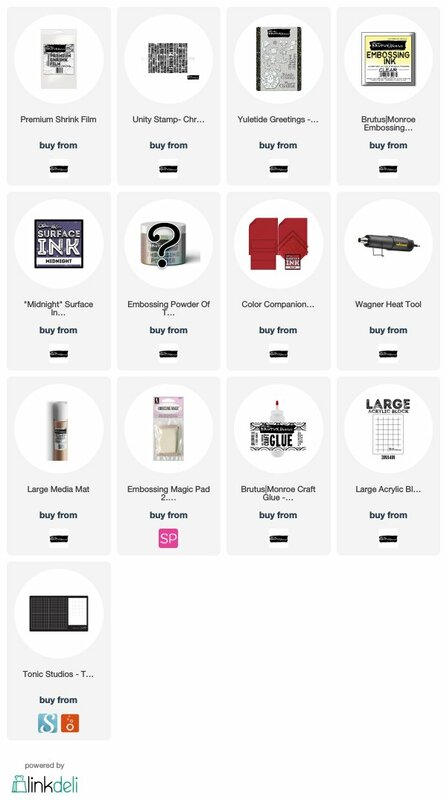 To begin the gingerbread man, stocking, gift, bells, ornaments, and Santa hat stamps were positioned in a Misti Stamping Tool. 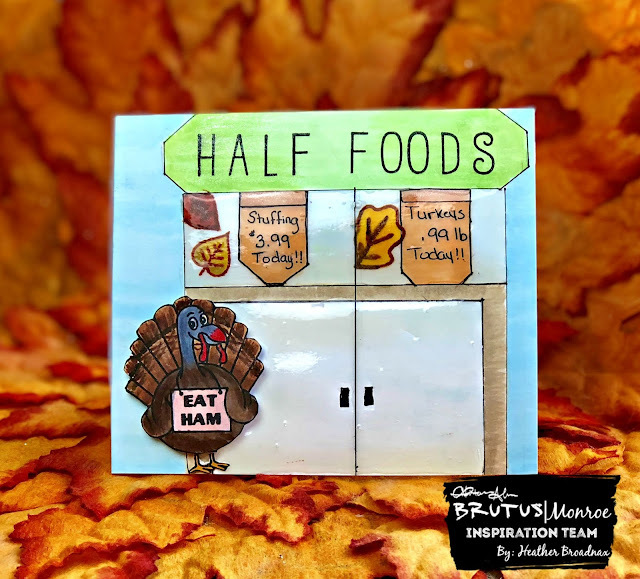 You could also use an acrylic block if you do not have a stamping tool. The shrink film is a slippery surface similar to acetate. I used Midnight Surface ink to stamp all of the images. Each did have to be stamped twice. Next, I gently applied heat, just enough to set the ink, not to shrink it up at this point. I have found it is easy to color the images with colored pencils before shrinking. Once all of the images were colored each was fussy cut. It is very simple to fussy cut images on the shrink film. To shrink the images I tried several ways to shrink using my heat tool. The first was "chasing it around my desk" which worked ok, but made it difficult to keep up with, then I tried holding it with tweezers, this did not work well at all. Finally. the best way I found to shrink was to put the image inside of an open ring, such as a lid to a mason jar. The ring kept the image confined as it was shrinking. The film shrinks very quickly. It will curl up and the panic will set in at first that it isn't going to work correctly, but then as if by magic it starts to flatten out. As soon as you see it start to flatten turn the heat off and apply something heavy, such as stacked acrylic blocks. 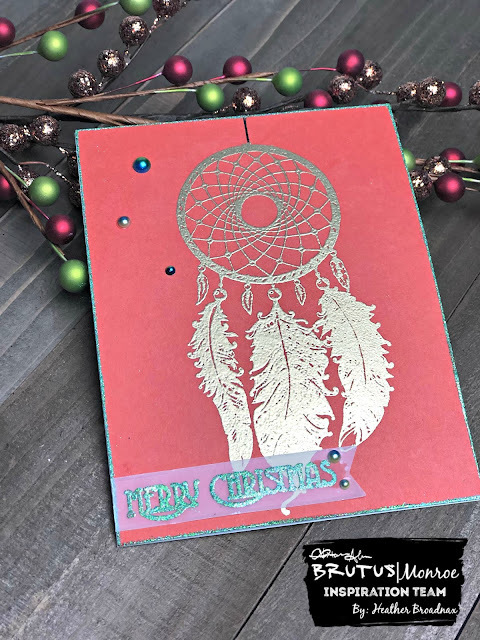 For the background I used Christmas Eve embossing powder, the November embossing powder of the month, on the Unity Stamp Christmas Over Again background stamp using clear embossing ink on a panel cut from Brown Butter cardstock. To add the "ornaments" I used twine that had a mix of gold and light tan attached to each piece with a glue dot. 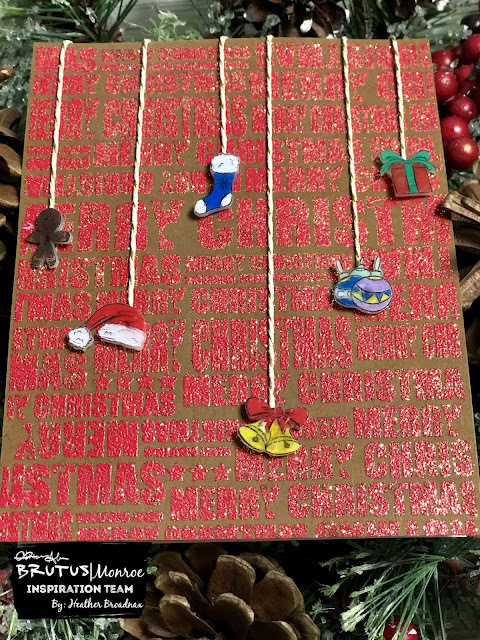 The panel was added to an A2 card base and that completes this fun shrinking ornament card. Don't forget to check out the rest of the teams shrinking projects below. Hello Friends! Heather B. here today with a Christmas Card using this month's inspiration box, which includes a beautiful 6 x 8 stamp set, Catching Dreams The set has a large dream catcher and several feathers as well as multiple encouraging sentiments. 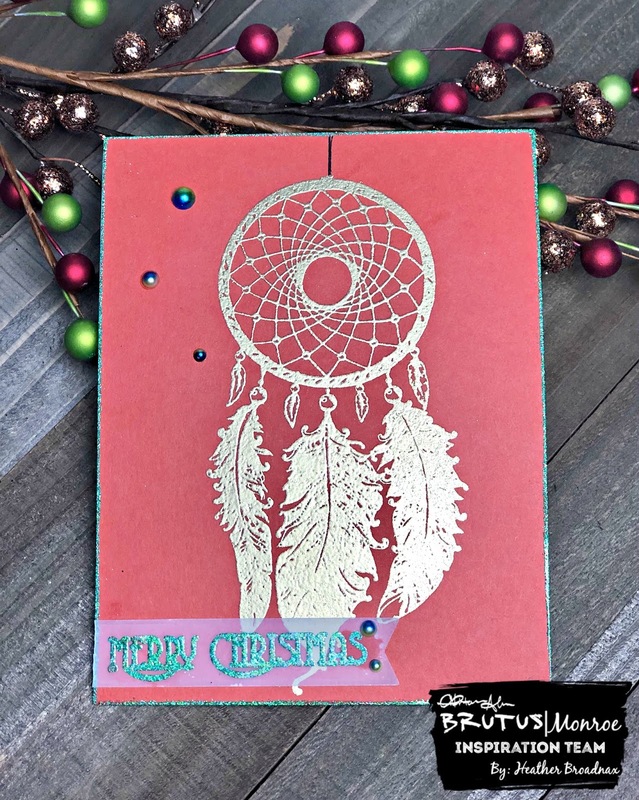 I wanted to use the large dream catcher stamp for the main focal point of the card. 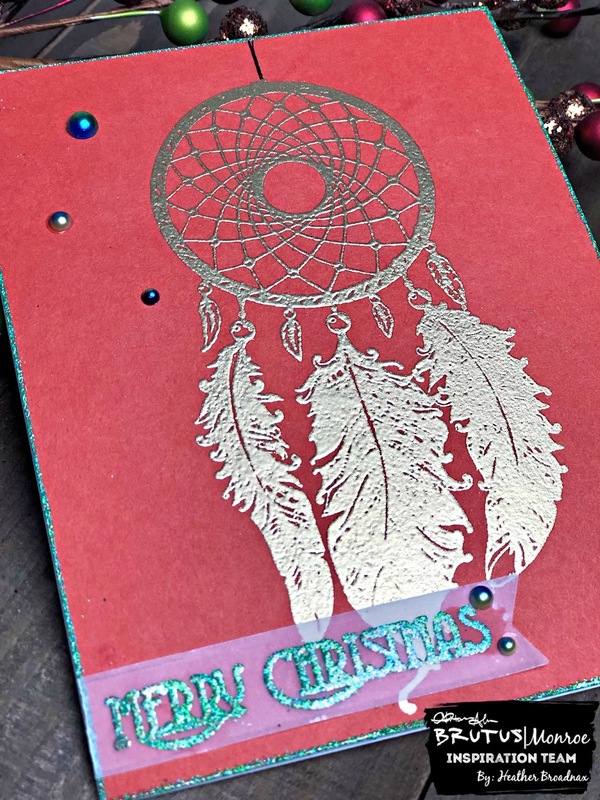 First, I stamped the dream catcher on a panel of Wagon cardstock using clear embossing ink. Next, Gilded embossing powder was added. To give the panel additional interest I ran the clear embossing ink around the edge of the panel and added Emerald City embossing powder. 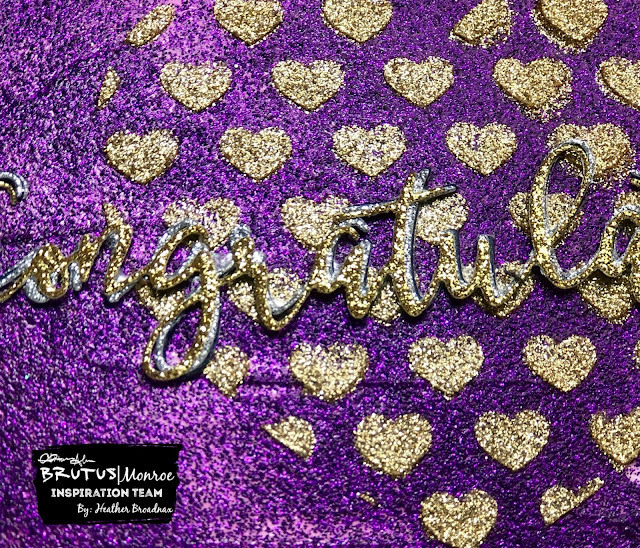 The same embossing powder was also used for the sentiment. The sentiment is from the 2017 Holiday Card Kit stamp set. There is a small "Merry Christmas" that fit perfect. The sentiment is stamped with clear embossing ink and the Emerald City embossing powder was added to bring together the sentiment and the edging of the card. To complete the card I added two-tone birds of a feather pearls from last months inspiration box. This card was very simple to make and the sentiment can be changed out to fit any occasion that you need. 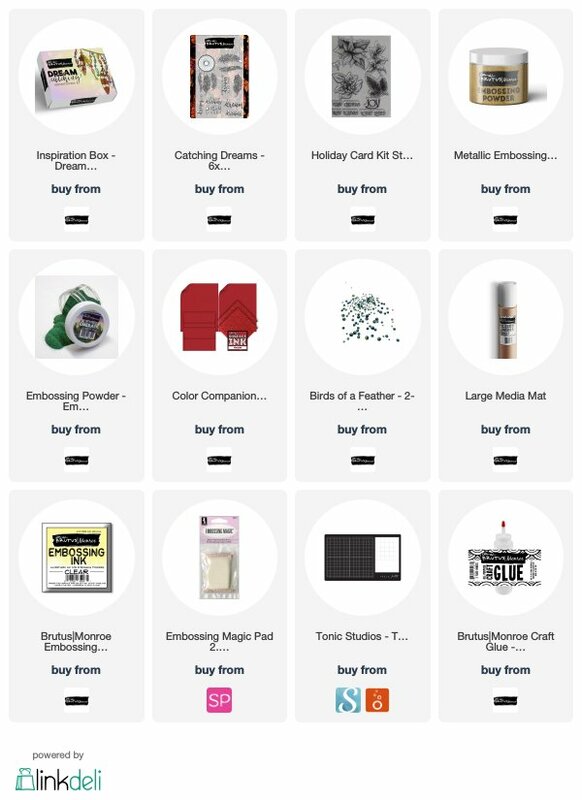 The Dream Catching Inspiration Box is still available. 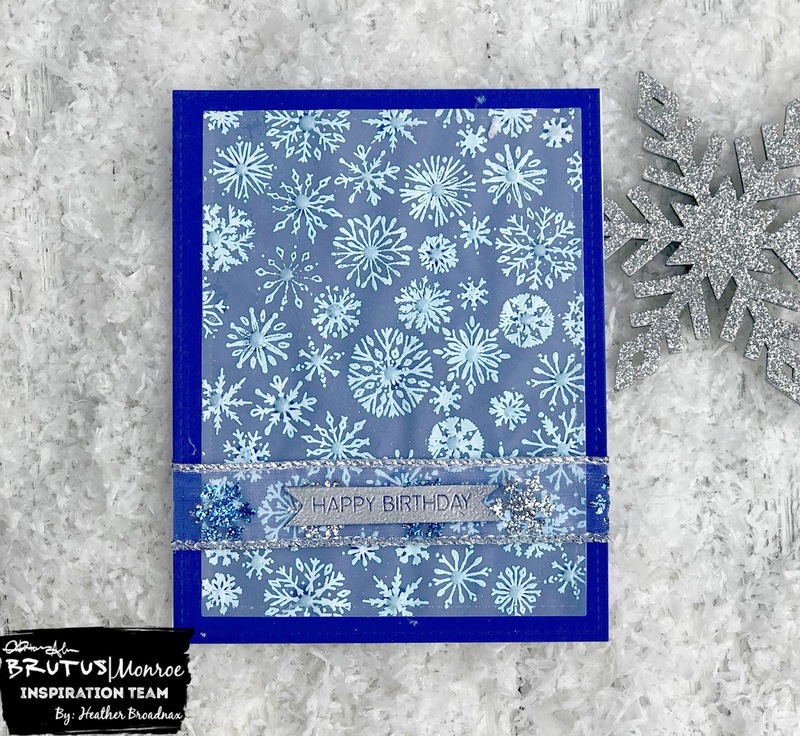 I will have several more cards using this kit for inspiration in the coming week. Happy Wednesday! 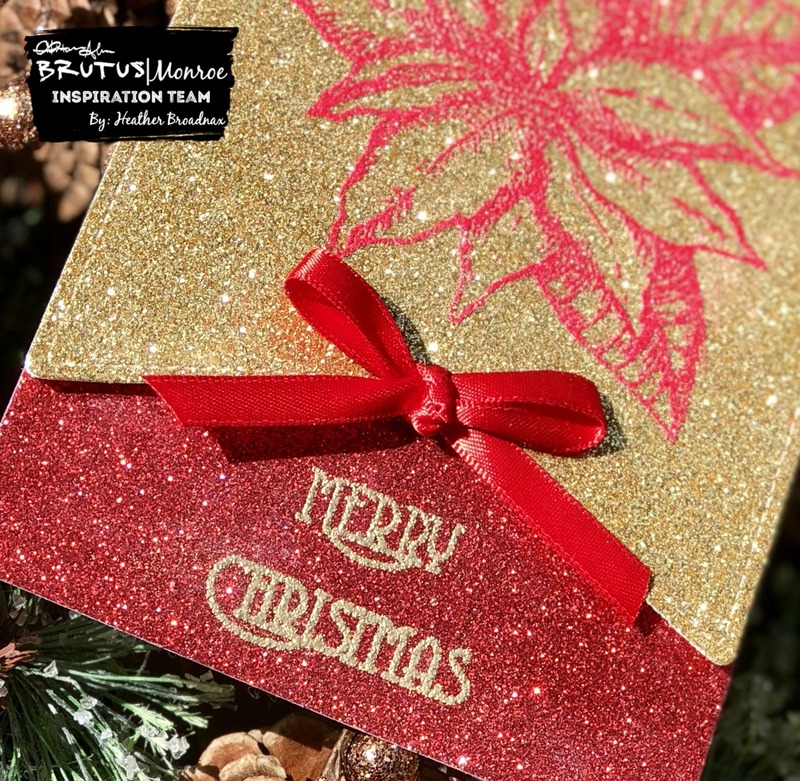 It is time for another Brutus Monroe Inspiration Team Blog Hop. This week we are showcasing shaker cards and all of the fun ways you can create with them. 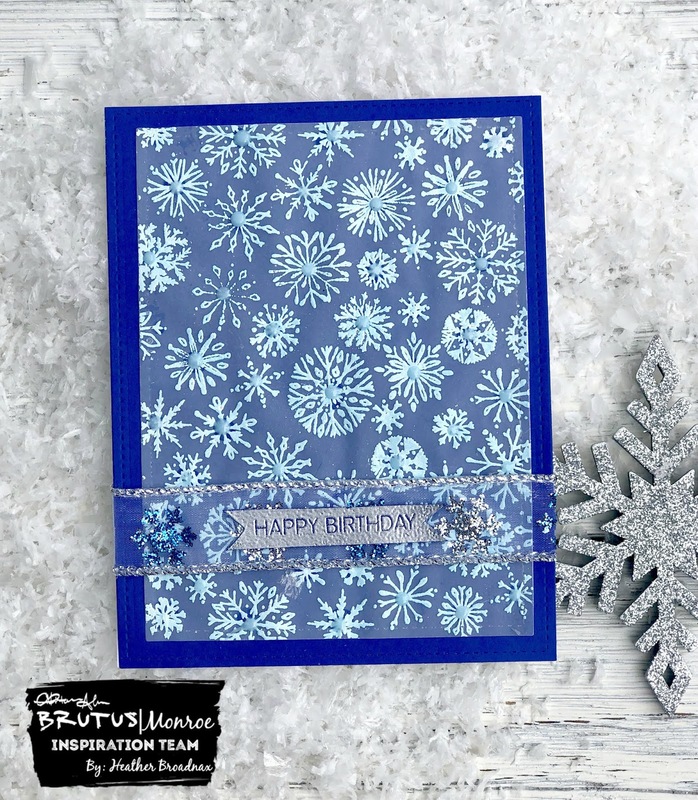 Brutus Monroe has several products to help you make fabulous shaker cards including two colors of foam tape, white and black along with self adhesive shaker pouches and a huge variety of sequins in many colors. For today's card I decided to create a fun shaker card using the Happy Birthday die set, Birthday Circle stencil and foam tape to create the shaker element. Let's get started on this shaking fun card. To begin I inked up a piece of cardstock with worn lipstick distress oxide, next using a spray bottle the stencil was sprayed with a heavy coat of water. Once the stencil is wet carefully flip it over onto the panel and careful use a rag to push down making sure the water reacts with the ink. Do not rub the stencil, you don't want it to shift. Carefully pick up the stencil and let it dry. After the acetate was added to the back of the panel, use a small amount of glue to add the inside pieces of the word "Happy." To create the area for my shaker bits I used white foam tape cut in half to form long boxes around each Happy. Three different colors of sequence were used for the insides, Cotton Candy Ballerina, and Glass Slipper bottle cap sequins. I used a generous amount of sequence behind each "happy." To finish off the back I added a panel of Mermaid Glitterstock. Finally, the Birthday die cut was adhered down and the entire panel was added to a card base. 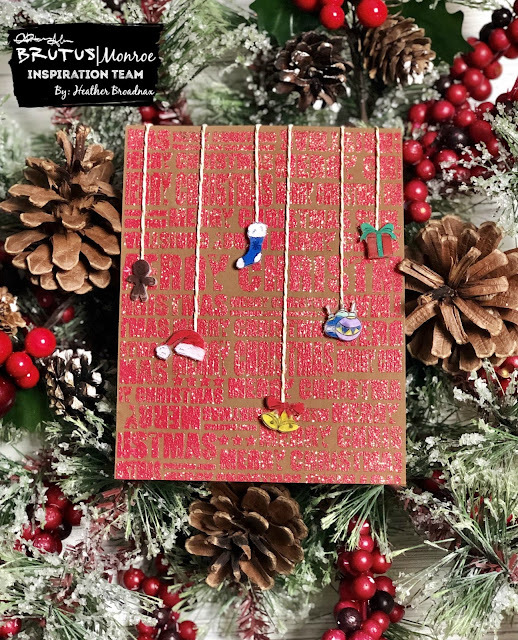 Check out all of the fun shaker cards by our Inspiration Team listed below! 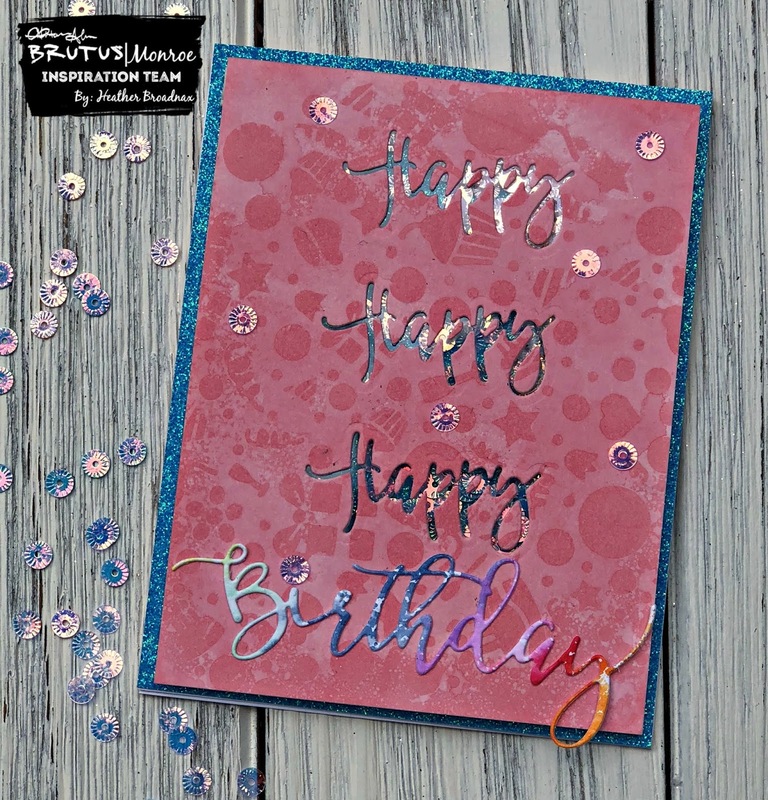 Heather B. here today showing you how to use an embossing folder and Aqua Pigments to create beautiful background for your cards. If you are not familiar with Aqua Pigments they are specially formulated watercolors that work beautiful on all types of mediums. We suggest using them straight out of the bottle but they can have water added to them to lighten any color within the range. Use Aqua Pigments for watercoloring and washes of color on watercolor paper or card stock. There are two sets, set 1 and 2 available along with a special edition Sparkling Holiday Set and Holly Jolly Set. There is also a metallic collection. Let's jump right in. 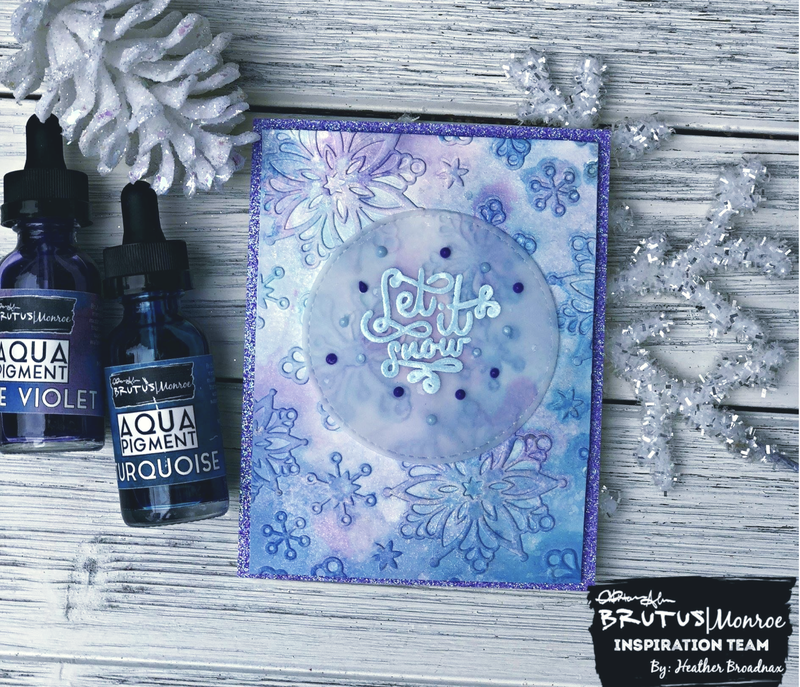 To begin I opened up the embossing folder on my Brutus Monroe media mat and added drops of Blue Violet and Turquoise Aqua Pigments to one side of the folder. The dropper bottle found on the Aqua Pigments make this step very easy. After I had the droplets placed where I wanted, water was then added to the folder using a spray bottle. The more water, the more your pigments will move when embossed. A piece of watercolor cardstock was put in the folder, you could also you Aqua Pigment paper for this technique. I did not have any at the time. Next, the embossing folder was ran through my die cut machine. The inks may push out of the folder. I kept a rag close to wipe up any over flow. Once you remove the paper you can add more color and water if there are area's that you want more color. You can truly Create Your Own Ending with this technique. Once the panel had dried it was cut down to fit a A2 size mat of Lilac glitterstock. For the sentiment I used "Let it Snow" from the Merry & Bright Stamp Set embossed with blue embossing powder from the Hanukkah set on a piece of vellum cut using the foundation circle die set. Once the sentiment was adhered with craft glue. To add a final touch Lilac Nuvo drops were added around the sentiment. Aqua Pigments are so much fun to use different techniques. We hope that you will give them a try and show us how you Create Your Own Ending on our Fan Facebook Page. Thanksgiving is upon us once again and the turkey's are trying to make their escape. This month's stamp club of the month stamp features one campaigning to be saved from the dinner table. 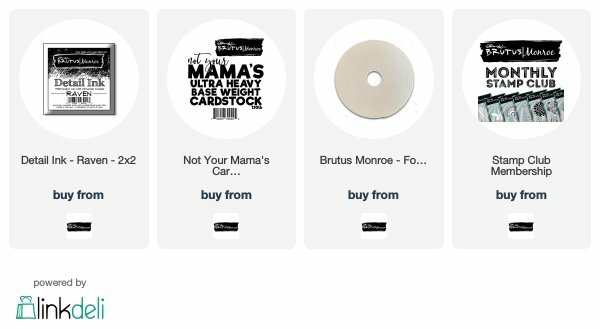 15% off of your everyday regular priced purchases at Brutus|Monroe.com (WOW!) 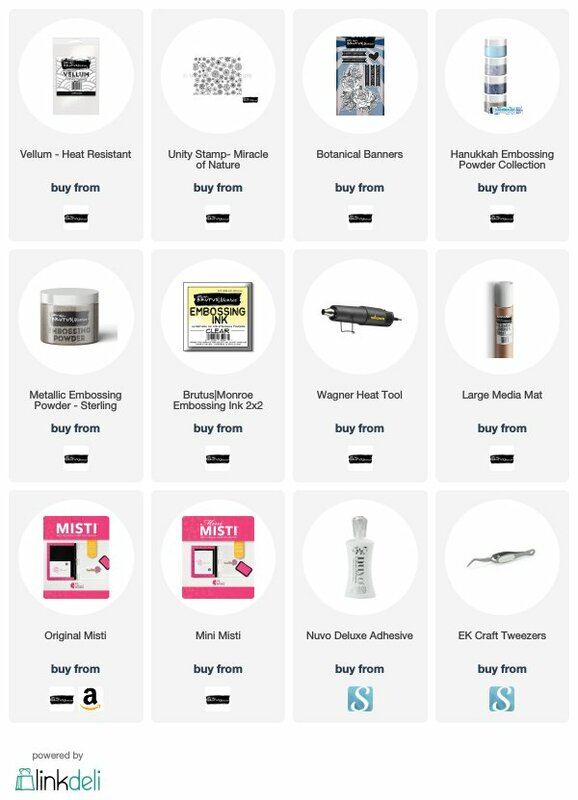 - this discount will be applied automatically the next time you sign in, if you are not seeing the discount immediately after your purchase, please refresh your browser. To create this fun, simple turkey card I stamped the turkey in Raven Detail Ink then colored him with copic markers. The background grocery store was hand drawn and then colored. I used the Autumn Sunrise stamp set to add the leaves. The background was finished off by adding added glossy accents to make the glass appear shiny. To complete the card I used the new Brutus Monroe Foam Tape to give the turkey dimension on the left side of the card. 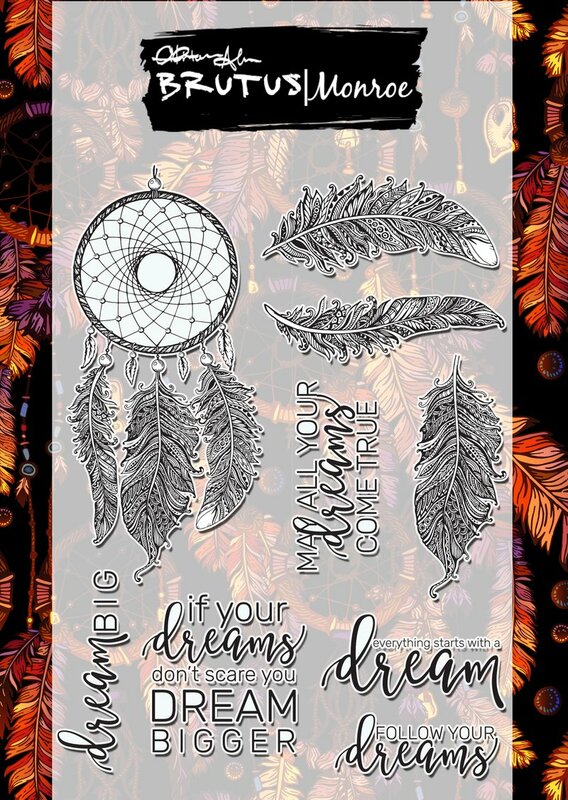 Our design team has some amazing cards and projects for you using the November Stamp Club stamp linked below. 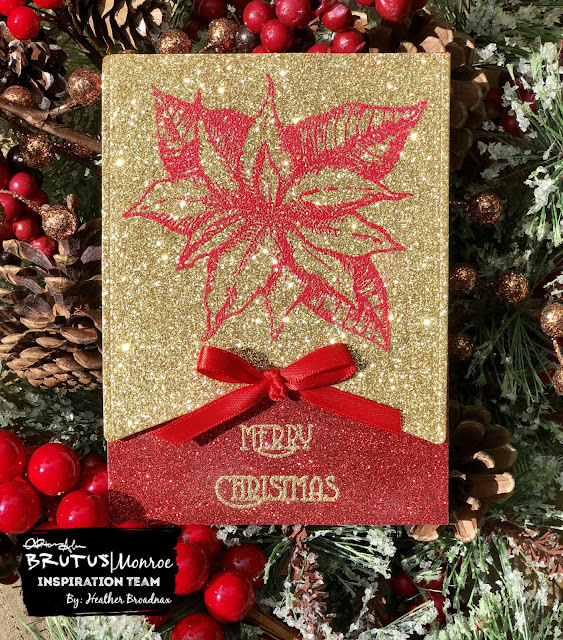 Heather B. here sharing with you a beautiful Christmas card using the November Embossing Powder of the Month, Christmas Eve and the gorgeous glitterstock. 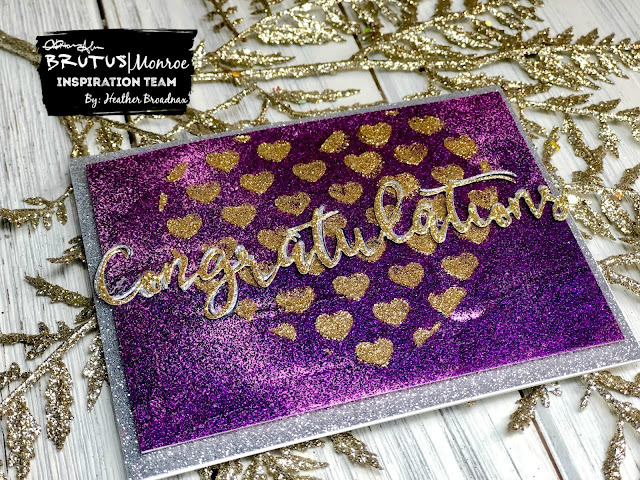 When I saw this months embossing powder I fell in love with it! I love red, and the gold added to this powder put it over the top! 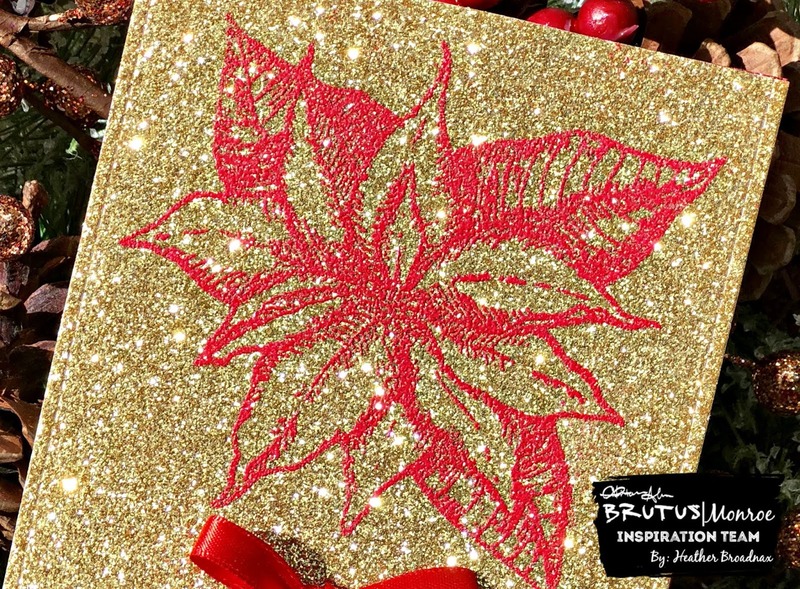 To begin, I stamped the poinsettia from the 2017 Holiday Card Kit Stamp set with clear embossing ink on a panel of gilded glitterstock cut using a fishtail banner. . Next, I added the embossing powder. YES, you can heat emboss on glitterstock. It comes out perfect! 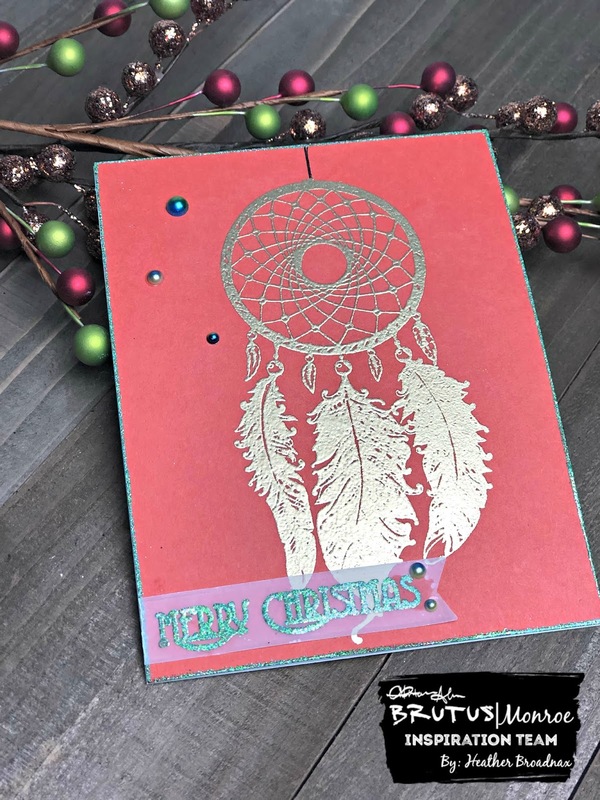 For the sentiment I used the "Merry Christmas" from the 2017 Holiday Card Kit Stamp heat embossed with gilded embossing powder on Scarlet glitterstock.. 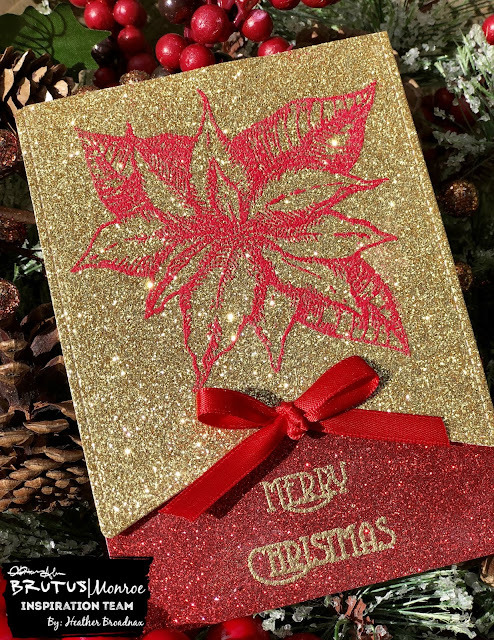 The gold of the gilded embossing powder on the scarlet is stunning. Scarlet is my favorite glitterstock. It is perfect for holiday cards. To complete the card, foam tape was added to the gilded glitterstock and adhered to the Scarlet glitterstock. The finishing touch was adding a small bow with red ribbon to the center. 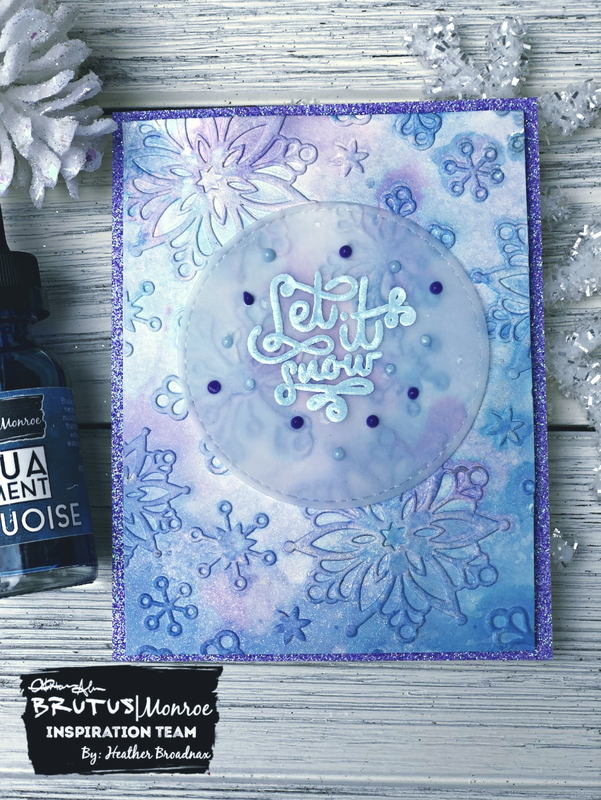 Don't forget to sign up for the Embossing Powder Club to get this gorgeous Christmas Eve embossing powder. When you sign up for the Embossing Powder club, you will receive never before released limited edition powder once each month. IF there are any powders left over from the subscriptions, they will be sold in store until gone. Also, as a subscriber, will also receive 15% off on every in store purchase at any time. All of this for only 8.00 a month! This card was very simple to make. It would be a great card to mass produce for holiday cards. Don't forget to show us what you create on the Brutus Monroe Fan Facebook Page.